The Aspire Atlantis is an innovative new design for a replaceable carto-tank. This is the first in its class and is extremely impressive. Its designed to blow clouds and produce excellent flavor and vapor – it does exactly what they say it will! Buy it now for $39.99! Aspire have been around for a few years now. Like their competitors such as Kanger, iTaste and others, they manufacture easy to use vaping gear for people who want convenience and who aren’t interested in rebuilding. While Aspire and many other companies make decent products, many complain that their stuff is cheap, underpowered and not capable of producing the best vaping experience. Its about convenience for newbie vapers. Aspire have been working hard to change this notion. They’ve been working with what they call BVC technology. 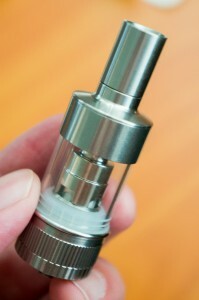 Basically BVC (Bottom Vertical Cartomizer) is a small, vertical cartomizer that screws in to the bottom of the tank. Early versions of this were quite awful, but as the company has progressed these types of cartomizers have become very good. The Atlantis uses a BVC carto and it performs amazingly well. I’ve really been impressed with this tank so far as it does exactly what they say it will. The air flow is fully adjustable from small mouth hits to full on lung hits. I haven’t had a tank yet that provided the flow for lung hits so for me this is really exceptional. And the thing is dead simple to set up. You just unscrew the bottom, fill, wait a few minutes for the carto to saturate, then vape. That’s it. So does it compare to my favorite RDA’s? Well its not an RDA and you have no control on how you build it. But I do really like the flavor and performance of the Atlantis. For me personally, its about 90% of the vapor and flavor I get from my rebuildable gear. Not bad for a tank. In fact, I always loved the Kayfun but never liked the heavily restricted air flow so honestly I haven’t used it in a long time. The Russian 2.0 or even the Russian 91% have been my main traveling tanks. I use these constantly in situations where dripping is not possible, but I still want to vape (long drive’s, commutes, etc). The Atlantis is the best tank that I’ve used so far. For me its a no-brainer that this goes into my travel bag. Plus the price is outstanding. The Atlantis comes in a plastic box. You get the actual device which unscrews in 3 sections. 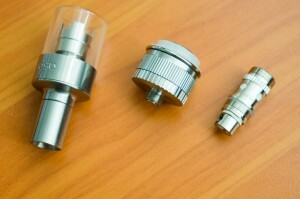 You also receive a drip tip, an extra pyrex glass tank, and an extra BVC replacement. The machining is high quality and all the parts fit together smoothly. Its very impressively built. My only complaints about the Atlantis are minor, but I think I should mention them here. 1) The BVC carto tank takes up a lot of space. This means the juice capacity is much less than other tanks. Again – its a tradeoff for the amazing performance so that’s okay. Its still a tank. But with this much vapor being produced, you will burn through juice much faster than you’d like to. 2) I can’t seem to find replacement BVC coils anywhere for sale. Seriously? I’m sure they’ll have this fixed in the next few weeks, but why would you release this with no replacements available? Nevermind – they’re available now – you can get them here. You CAN rebuild these coils if you want to save money or experiment a little. Despite the minor caveats, the Aspire Atlantis is amazing. There is no other tank out there that performs like this one. And its about half the cost of the high end tanks like the Kayfun, Orchid, etc. There’s no rebuilding – its dead simple to use. I really like seeing devices like this that come out and push the bar higher. Vaping gear has come a long way in the last 2 years and I like what I see. Get the Aspire Atlantis today – you won’t be disappointed! Posted in TanksBookmark the permalink. I’m thinking of getting the Aspire Atlantis on the IPV v2 mini I was wondering if you have any better semi cheap setup ideas! Please let me know.